The idea of a hanging garden installation came from the urge of the citizens of Aachen to reimagine the unused building site of the shopping mall “Kaiserplatz Galerie”. The project has been on hold since many years, forming an wound in the heart of the city. After a series of public discussions, a collective reuse proposition was clarified - an urban garden. 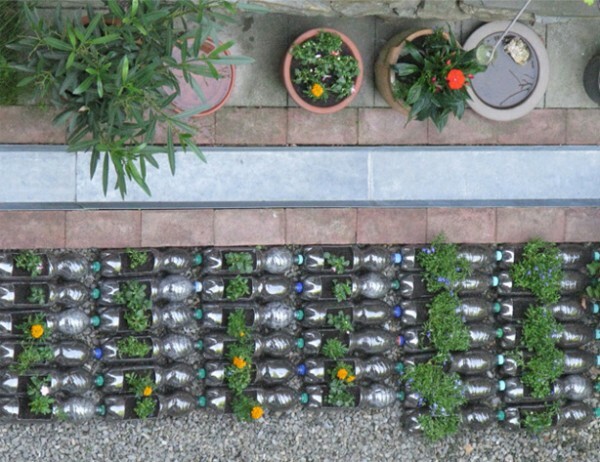 We took part in the initiative and co -created did an urban installation consiting of hanging recycled bottles filled with soil and plants. The site chosen for the art project was the wooden wall surrounding the unused lot. As the wall is private owned we had to come up with a solituon, which does not harm the wall itself and can be easily removed. The flower bottles were hanged upon the wooden plates on pegs. The purpose of the installation is to set a statement for a sustainable temporary use of the lot and to arise a curiosity about urban gardening among the public. The intervention has been very succsessful, covered widely by the local media and receiving a great positive outcome from the citizens. The bottles have been hanging for a long time, and the people living nearby have been taking care of them,repairing and replacing them with new ones. The shopping mall is in the building phase at the moment, however the city of Aachen offered an unused lot to be used as an urban garden. In this sense the art installation completed its purpose.